Hudson – Hudson High School’s fall musical, “The Adventures of Tom Sawyer, The Musical” will be presented Nov. 17-19 and 21. Based on the classic Mark Twain novel, “The Adventures of Tom Sawyer” is the story of a 14-year-old boy growing up in the heartland of America. Filled with foot-stomping, toe-tapping songs by Don Schlitz and with a book by Ken Ludwig, this musical adventure is filled of thrilling escapes, comedy and inspiration for the whole family. Set in 1840 Missouri, “The Adventures of Tom Sawyer” is the tale of young Tom Sawyer (Ilan Levine) and the never-ending mischief of which he so often finds himself a part; whether it’s matching wits with Aunt Polly (Katelyn Moran), tricking his friends into whitewashing a fence for him or narrowly escaping the clutches of a murderous villain. 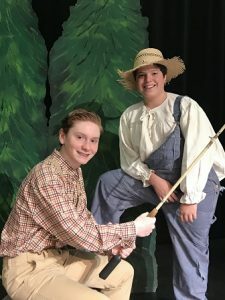 Along with his best friend, Huckleberry Finn (Patrick Fortuna), and his love interest, Becky Thatcher (Celina Chaves), the greatest Tom Sawyer exploits are plucked from the book and plopped onto the stage. Shows are Nov. 17 and 18 at 7 p.m., Nov. 19 at 2 p.m., and Nov. 21 at 6:30 p.m. Tickets will be sold at the door for $10 and all proceeds directly benefit the Hudson High School Drama Society. This show is rated PG and recommended for all ages. Call 978-567-6250, ext. 10131, for more information.